What follows is a guest post by an experienced, thorough and brilliant acne advocate who runs the site and blogs at AcneEinstein.com. I followed Seppo’s advice to use a topical antioxidant, and that has been the nail in my acne’s coffin. It has also been the best thing I have done for the overall softness, radiance, and evenness in tone of my skin in ages. Seppo’s blog is incredible for acne — the real deal. All of which is to say, this is good stuff. For acne and hormones, I trust me. For acne and the gut, I trust Chris Kresser. For topical approaches , antioxidants, and explaining how they all tie together, I present Seppo Puusa. Acne is a common co-occurrence of PCOS and other hormonal imbalances. This causes some people to come to the unfortunate conclusion that they have to ‘fix their hormones’ before they can get over acne. While it’s true that hormones are a big part of acne it’s equally true that there’s more to acne than hormones. And the ways to deal with acne need not be limited to hormonal fixes. In this post I want to introduce you to the other side of acne and hopefully share some ways to get clear that go beyond hormones. Let’s start by taking a moment to understand why you get acne. After reading hundreds of studies, I’ve realized there’s a rather simple explanation to acne, and we can explain most acne cases with this model. Over the past decade scientific understanding of acne has moved away from bacteria causing acne towards inflammatory origin of the disease. More specifically, good evidence exists to show inflammatory damage to sebum (sebum oxidation) is what really triggers the acne formation process. Other ‘causes’ of acne (diet, gut issues, hormones, etc.) simply set the conditions for sebum oxidation to happen. Comedogenicity of squalene peroxides has been demonstrated in animal experiments in which comedones have been induced by exposing rabbit ears to irradiated squalene. The degree of squalene peroxidation was found to correlate positively with the size of the comedones elicited. In addition, the treatment of ear skin with squalene peroxidation by-products caused marked hyperplasia and hyperkeratosis of the epithelium in follicular infundibulum, and increased the proliferation of the sebaceous glands. Let me translate that from science-speak to clear English. Applying squalene peroxide to rabbit ears caused comedoes (pimples) to form, and the severity of acne was related to the degree of damage squalene suffered. Squalene peroxide also caused abnormally high rate of skin cell growth and sebum and keratin production; keratin is a tough protein that binds skin cells together, excess keratin production is a feature in many skin conditions. These are ideal conditions for microcomedoes to form. Microcomedoes are the earliest stages of a pimple, and form before bacteria colonizes the skin pore. 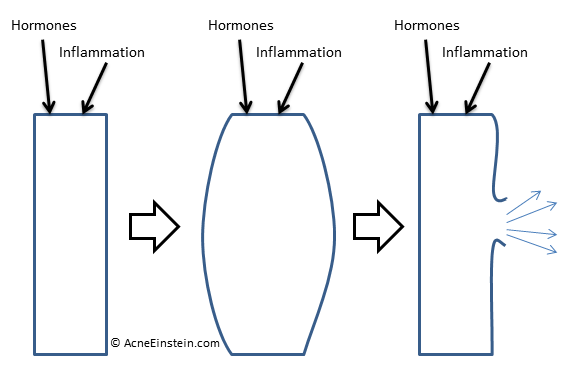 This is why many researchers now believe inflammation is the trigger that sets off the acne formation process. Noninflamed lesions, which are first visible during the adrenarche in acne-prone individuals, do not contain propionibacteria. Comedogenesis appears to be independent of bacterial infection and may be driven by high levels of bioactive interleukin-1α derived from ductal hyperkeratinocytes. In other words, the very earliest stages of a pimple don’t contain bacteria. Start of the acne formation process seems to be triggered by inflammatory signals from keratin-producing cells (the result of exposure to squalene peroxide) and has nothing to do with bacteria. There’s even evidence to show that bacterial colonization of a blocked pore is the result of inflammatory damage and might have not even be possible without it. P. acnes, once thought to be the initiating factor of inflammatory acne, might never make the pilosebaceous unit its home were it not for this initial inflammatory insult to the sebum. Oxidation of sebum alters oxygen tension in the follicle, resulting in the micro-aerophilic environment required for P. acnes to survive. Apparently, inflammation and oxidative stress might set the stage for all subsequent pathogenic factors leading to acne. This is not to say that bacteria wouldn’t affect acne, they just enter the picture later. Once a microcomedo has formed, bacteria colonize it and massively increase inflammation in the area. This is what turns blocked pores into painful cysts. But none of that would happen without the initial inflammatory damage to sebum. To put simply, there’s no acne without oxidative damage to sebum. And that’s why most of your efforts to get over acne should be aimed at preventing that from happening. A case can also be made for antibacterial agents to control the pimples that form despite your efforts to prevent them – it will happen because of genetics; you can now go and thank your parents. Obviously there’s more to acne than this. 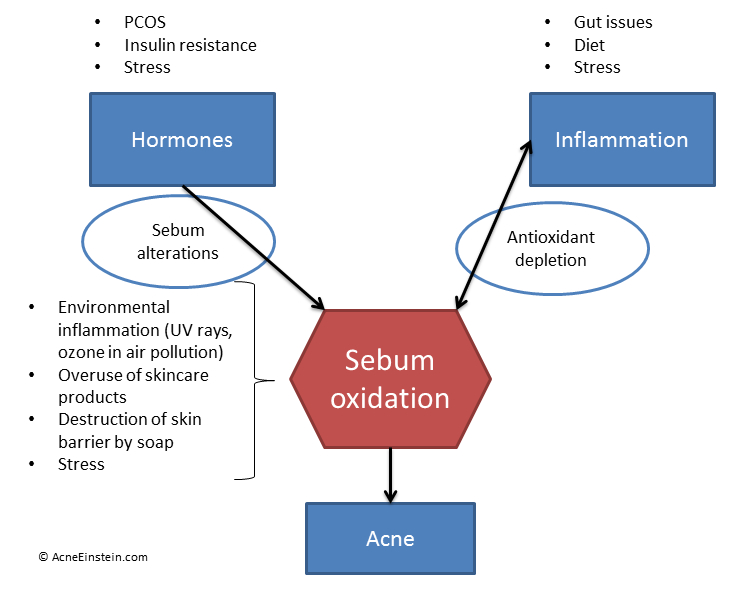 But I wanted to stress the importance of sebum oxidation as it seems to be the point of convergence in acne, and all the other factors merely set the conditions for sebum oxidation to take place. 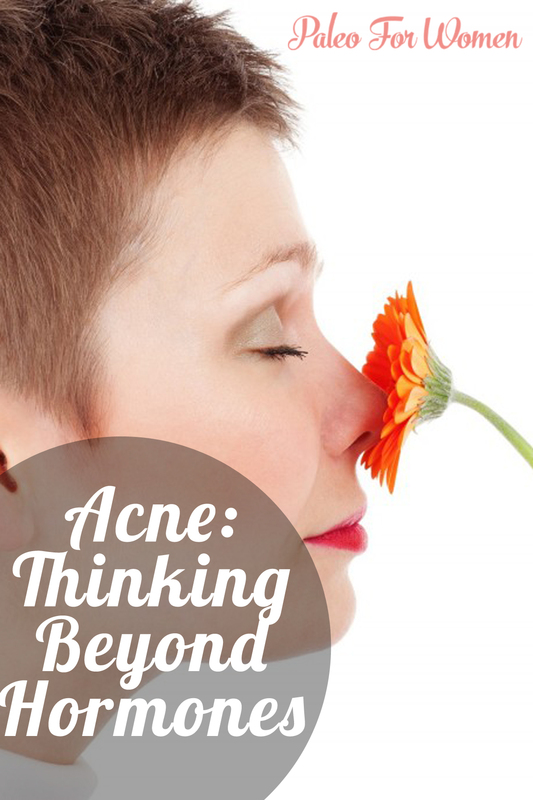 Beyond the skin, there are two ‘things’ that cause acne: hormones and inflammation. Here’s a good analogy to understand how these affect acne. I’m a guy, so hopefully you’ll forgive me the engineering reference. This masterpiece of art represents a hose with 2 inlets. The hose is a skin follicle (or skin pore) and the inlets represent hormones and inflammation. The more imbalanced your hormones are and the more systemic inflammation you are under, the more pressure the hose has to bear. At some point the pressure gets too high and the hose ruptures. So it’s not that hormones or inflammation (via diet, gut, stress, etc.) cause acne as such, but they put pressure the skin, and if that pressure gets too high, then you get acne. Hormones affect both sebum production and composition. Acne patients not only produce a lot more sebum but sebum also has proportionally more squalene. Diet-acne studies have shown that reducing the glycemic index of diet reduces the hormones associated with acne and this reduces sebum production and alters sebum composition. Systemic inflammation affects the skin by depleting antioxidant reserves. Antioxidants of course protect you from inflammatory damage. The primary antioxidant in the skin is vitamin E, and studies have shown a tight correlation between secretion of squalene and vitamin E; suggesting vitamin E is used to protect squalene from oxidizing and the harmful consequences it has. 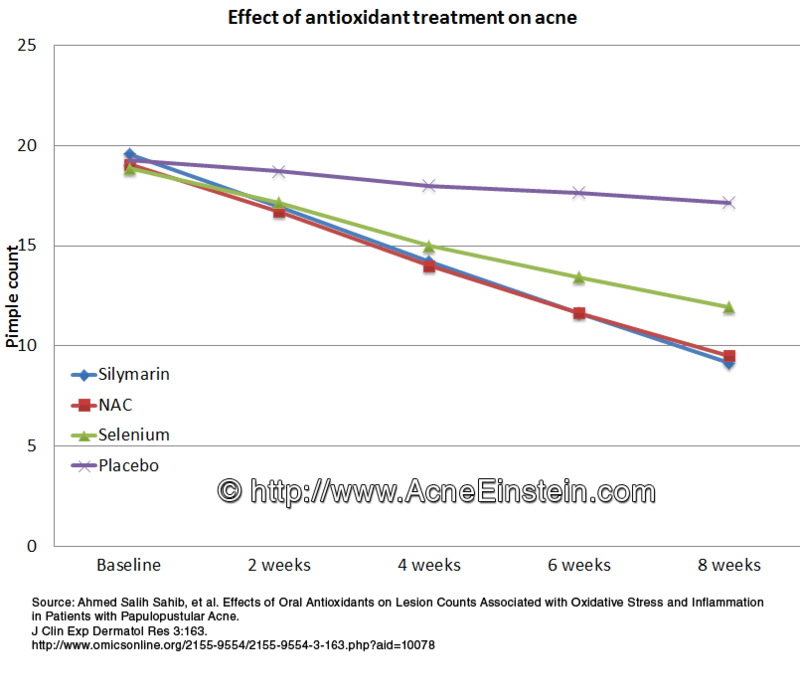 There’s evidence that the antioxidant system just cannot cope with the demand in acne. For example, earlier this month a study came out that showed acne patients have significantly lower blood levels of vitamins A and E and zinc. Other studies have looked at antioxidant and inflammatory markers in blood and skin and have found similar results. Shortage of antioxidants leaves sebum vulnerable to inflammatory damage and opens the door for acne. So in summary, hormones regulate how much sebum the skin produces and the fatty acid composition of sebum. If your skin produces more sebum it also needs more antioxidants protection. Inflammation depletes finite antioxidant reserves and may leave sebum vulnerable to inflammatory damage. Without adequate antioxidant protection squalene suffers oxidative damage and forms squalene peroxides. Squalene peroxide is massively comedogenic, causes hyperkeratosis, and sets the stage for acne. But I really hope that the framework we just talked about helps you to think about acne more broadly. Diet and other hormonal fixes should help your skin, but they need not be your only options. Use protection. The skin is constantly exposed to inflammatory damage (think UV, air pollution, chlorine in swimming pools) that can harm the skin barrier function and leave the skin vulnerable. Applying some moisturizer in the morning goes a long way in keeping your skin healthy. Also remember to apply some after you’ve been swimming. Consider taking an antioxidant supplement. Studies have also shown supplemental antioxidant could be helpful in acne, though the data is much weaker. Supplements that have been shown to be effective include zinc and N-Acetyl Cysteine (NAC), a precursor to antioxidant enzyme glutathione. People often have an unfortunate tendency to latch on a single factor as The Cause of acne (I just need to fix my diet and then I will get clear, or this darn PCOS is making a mess of my skin). While there is truth to these sentiments it’s good to remind yourself of the big picture. Acne is the result of a combination of genetics, hormones and inflammation. Together they conspire to create the perfect conditions for sebum oxidation to take place, which then kick starts the acne formation process. Improving your diet and taking steps to address hormonal imbalances will help, but they need not to be your only treatment options. Seppo Puusa is the author of the AcneEinstein.com blog – The place for rational, science-based advice on natural and alternative acne treatments. Are there some antioxidant moisturizers you could recommend? Here are a few products that look good, at least based on the label. As a disclaimer I have to say that I make the judgement based solely on the label. And given how lax the regulations are, what the label says and what’s in the bottle don’t always match. This list also contains cleansers and toners. I just ordered 3 products from this list for myself, the AHA facial cleanser, Derm-e toner, and Eventone dark spot corrector as moisturizer. I’ve also used the Madre Labs EGCG cream before and was quite happy with it. I can recommend the Eminence products, especially the probiotic line. No comments yet? I thought this was a great post. I had bought an antioxidant primer from 100% Pure makeup and never really used it. After reading this post a few days ago, I started putting it on even though I wasn’t going to wear any makeup over it. I have already seen a difference in my skin over the past few days, and I’m currently going through a food-related breakout. Thank you for the great article and information, Seppo! Sorry about my late reply. I subscribed to be notified of new comments, but for some reason haven’t gotten any emails. Anyway, I’m glad to hear your skin is doing better already. Not sure what antioxidants your primer contains. Research on these things is fairly sparse yet, but there’s good evidence to support vitamin B3 (either as niacin or nicotinamide) and vitamin C precursor sodium ascorbyl phosphate (SAP). Green tea extracts also show promise. So when your current product runs out, I would look for a product with one of those ingredients. This is great! I love the idea of tackling acne from the inside and outside. I just got a vit C serum and started taking NAC and selenium so hopefully that keeps me from breaking out. What is the best topical treatment to prevent sebum oxidation? Vitamin C and vitamin B3 seems to work well. Green tea is another possibility. should be used with caution by anyone who has low iron stores (one blood test doctors often do to check on this is called “serum ferritin”), because Milk Thistle is an excellent chelator (remover) of iron from the body. It happened to me — I took Silymarin for only a few weeks and it caused my serum ferritin level, which sits at the low end of the “normal” range at the best of times, to plummet 20 points, down into the “deficiency” range. If you want to know more about this function of Silymarin, it is mentioned on a number of websites, and in some PubMed research articles. Apparently Grapeseed Extract is a very good antioxidant supplement for skin. Also, I’ve read that a number of people find that supplemental Evening Primrose Oil does good things for their skin. I’ve used Mad Hippie Vitamin C serum, which I thought felt nice and brightened up my complexion a bit; but I’m not sure whether it helped with my acne. Major blackhead and some ever-present red spot (and PCOS) sufferer here.